Greenwashing Culture examines the complicity of culture with our environmental crisis. 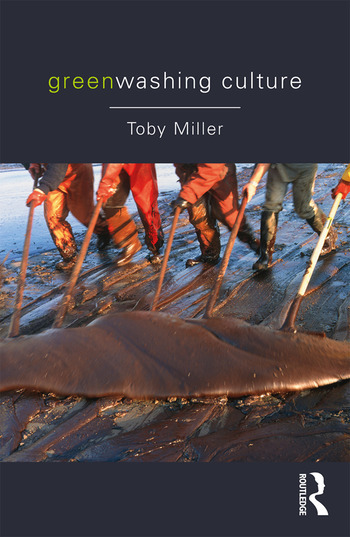 Through its own carbon footprint, the promotion of image-friendly environmental credentials for celebrities, and the mutually beneficial engagement with big industry polluters, Toby Miller argues that culture has become an enabler of environmental criminals to win over local, national, and international communities. radical environmental reform, via citizenship and public policy, illustrated by the actions of Greenpeace against Shell's sponsorship of Lego. This is a thought-provoking introduction to the harmful impact of greenwashing. It is essential reading for students of cultural studies and environmental studies, and those with an interest in environmental activism. Toby Miller is Research Professor, University of California, Riverside; Sir Walter Murdoch Professor of Cultural Policy Studies, Murdoch University; Profesor Invitado, Escuela de Comunicación Social, Universidad del Norte; Professor of Journalism, Media and Cultural Studies, Cardiff University/Prifysgol Caerdydd; and Director of the Institute for Media and Creative Industries, Loughborough University London.